Will You Play With Me? Share this creepypasta on social media! I know most of you have heard plenty of stories of possessed evil dolls, or cursed toys that have caused who knows how much damage to their owners, but let me tell you, sometimes it’s the most mundane things that can really freak you out. Unfortunately, I was too ignorant to help the one person who really needed my help at the time, but I hope it isn’t too late to warn others. Especially since it might be too late for me. There’s a guy who lived next door to me. He wasn’t at the end of the street, or in some old drafty house. It was just a regular old colonial, but the guy was obsessed with Legos. I don’t know if he was ever featured on the news or not, but he always had something new set up in his front yard. In February he built a big heart with a life-sized Lego man proposing to a Lego woman, which was actually pretty neat. In July, he reenacted that famous photo of the Iwo Jima flag raising. It was a little silly, maybe, with the yellow Lego heads on the army men, but again, it was certainly nothing to sneeze at. But Halloween was when he went all out. Lego wolfmen, Lego vampires, Lego webs. He even had all of these torture device things he put up, like the rack, an iron maiden, thumb screws, even things that wouldn’t have looked out of place in a Saw movie. Thing is, not only did he build stuff really well, but most of it worked. The proposing Lego man’s arm actually could move up and down. The Iwo Jima flag was bendy and could wave if pulled. And all those Halloween things? Yep, the Iron Maiden could close, and all those little traps could actually twist and turn. Not that anyone could hurt themselves…all the spikes in the Iron Maiden were missing, and thumb screw didn’t actually drop, but I didn’t even know that level of detail was possible. As far the guy himself, he wasn’t exactly what you expected from a thirty-something guy who collected Legos…he was tall, fairly athletic, clean shaven, no glasses. Even smelled like he showered regularly. But I guess collectors come in all shapes and sizes. He was always friendly with the neighborhood kids, and he even let them play with the stuff on the lawn, as long as they didn’t steal anything. Not that anyone really could, as on closer look, the Legos were all glued together. I assumed super glue, but whatever it was, it was strong. I know one kid almost broke a nail trying to get one off once. It really made the neighborhood special, in a lot of ways, not the least of which because at Christmas, he would send a few lucky kids in the neighborhood their own special toys. My own kids had been looking forward to getting their toys for a long time, but it hadn’t happened yet. But then there was Chris. Chris was a teenager in the neighborhood who had a long history of discipline problems; he came from a broken home, and was having issues in the foster system, and he lashed out a lot in school. I knew him because I taught there and he was in my math class. When I saw him struggling with his lessons, I offered to tutor him after school in the campus library, and he seemed to respond to it, and to me. Still, I was sure that even if he trusted me more than most people, there was a lot he wouldn’t tell me. I was pretty sure he stole little things like candy bars and other small criminal acts…nothing I could prove, and quite frankly, I liked him, and the less I knew about what he did when he wasn’t in school, the better. It was a week or two after Halloween, just after dinner, when I got a knock on the door. It was Chris, and he had something under his coat. Oh, no, here it was. He asked me to sit outside with him for a minute. I got my coat, and he sat down with me on a bench in my front garden. It was entirely made out of Legos. Top to bottom. The claw was even put together with the pointy pieces I hadn’t seen in sets in a long time. I’ve never seen a children’s toy look so intimidating. It shouldn’t have been, with all the yellow, blue, and red bricks making it up, but as it had been glued together with very strong glue, I am pretty sure you could’ve done some damage with it. “Chris, where did you get this?” I didn’t need to ask, since I already knew, but the answer he gave still surprised me. “That Lego guy? I wanted to see all the stuff in his basement, since I didn’t get a chance to go over there on Halloween. But he had a door open in there, a door that you don’t see when it’s closed, going under the stairs. There’s a chair in there. And this.” He shook it. As strange as all this was, I didn’t believe his story. I wanted to, because I wanted to believe he was a good kid, but I couldn’t. As weird as a Lego hammer was, there was nothing wrong with it. And he had broken into a house. I didn’t want to rat him out, but didn’t know how to tell him without being a jerk about it. After Chris left, I looked over at the Lego guy’s house. I figured he was a little odd with all his stuff, but criminal? Probably not. What was there to worry about? I got worried when Chris was not in school the next day. Nobody had seen him I called his foster home and they said he hadn’t come back the night before. They had already called the police themselves, afraid he had run away. Now very concerned, after school I went to my neighbor’s house. His Thanksgiving decorations, usually up by now, were conspicuously absent. I knocked, but he didn’t answer. Just on a whim, I tried the front door, and found it was open. I didn’t know if I should go in, but considering what I had heard the day before, I wanted to be sure everything was OK. I called in, asking if there was anyone there. I got no answer. I peeked in. In the front hall, there were the Thanksgiving Legos, a giant turkey and pilgrim hat, but they were shoved against the wall, like they were pushed out of the way in a hurry. I called out again, and noticed the basement door open. If I had known then what I know now, I would’ve just gone back and called the police and let them handle it. I guess more than anything I was concerned about Chris than I was about how strange all of this was. But I went into the basement. The place was full of Lego constructions. You could barely walk for all the things that were shoved into there, ranging from life-sized Lego people to scale model aircraft carriers, holiday decorations, and God knows what else. He had never put up even half of what he had built on display. And quite frankly, I was glad. Some of the things he had ranged from normal to downright disturbing. He had a model of the Telltale Heart built, with the psycho staring at the floor while the police stared at him in horror. The French Revolution, with the guillotine dropped and several Lego heads in a basket. And beyond those, some grotesque creature, all twists and turns, with no discernible head. It looked all wrong, a sculpture Dali would have had nightmares about, and it was eating Lego people in a scale model city. The Iron Maiden in the corner was shut, along with the other Halloween decorations. But there was no sign of anyone living anywhere. I went along the staircase, but I didn’t see any room. I felt along the shelves attached to it, loaded with all the regular Lego fun sets you normally see, and found what felt like a handle built into the underside of one. It turned, and with a click the hidden door opened. Inside was a small room, more a closet than anything. A single light bulb hung over a chair, with a table next to it in darkness. I pulled the lamp cord. On that table, was the hammer Chris had shown me the other day. And next to it, was a pile of teeth. I gagged, and ran out of the closet. I stumbled over the proposing Lego man and knocked him over. For the first time, the glue cracked, and his hand fell off. Underneath was a shriveled human hand. I scrambled up again and saw the Iron Maiden once more in the corner. This time, I saw a puddle beneath it, and a pair of eyes in the slot of its door. Even though I couldn’t see them clearly, I somehow knew they were Chris’ eyes. I called the police. All signs showed Lego guy had left town that morning, though they put out an APB for him. They found more bodies hiding inside the Lego figures…I didn’t want to know more when they said it could be more than 15, all mummified and sealed away in their toy coffins. And the torture devices? DNA swabs showed they had been used. Many times. They didn’t know whose DNA it was, since they had no one to compare it to, but many samples had been found. And Chris. I should have listened to him. I was shaken when they pulled his body out of the house. They still haven’t caught him. He could be anywhere by now, in any town, putting up displays. Maybe not Legos anymore. But I know he’ll do anything to impress. I know because some boxes came in the mail for me. Well, not for me, but for my kids. I don’t want to open them. But I’m afraid what might happen if I don’t. All I know is, the boxes smell like glue. Very strong, industrial glue. 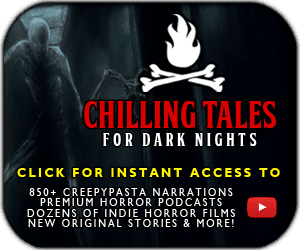 If you wish to narrate the story please contact Chilling Tales for Dark Nights for permission by clicking here. If you enjoyed this story, please share it on social media! Sign Up Now And Get The Best Creepypasta's In Your E-Mail Inbox! Rating: 9.12/10. From 19487 votes. Rating: 9.12/10. From 7547 votes. Rating: 9.12/10. From 494 votes. Rating: 9.11/10. From 11170 votes. Rating: 9.10/10. From 2102 votes. Rating: 9.10/10. From 1915 votes. Rating: 9.10/10. From 765 votes. Rating: 9.10/10. From 622 votes. Rating: 9.10/10. From 191 votes. Rating: 9.10/10. From 164 votes. Rating: 9.09/10. From 8834 votes. Rating: 9.09/10. From 5037 votes. Rating: 9.09/10. From 3396 votes. Rating: 9.09/10. From 2599 votes. Rating: 9.09/10. From 2240 votes. Rating: 9.09/10. From 2238 votes. Rating: 9.09/10. From 2191 votes. Rating: 9.09/10. From 2091 votes. Rating: 9.09/10. From 2072 votes. Rating: 9.09/10. From 1770 votes. Rating: 9.09/10. From 1517 votes. Rating: 9.09/10. From 1214 votes. Rating: 9.09/10. From 1122 votes. Rating: 9.09/10. From 958 votes. Rating: 9.09/10. From 921 votes. Rating: 9.09/10. From 828 votes. Rating: 9.09/10. From 695 votes. Rating: 9.09/10. From 512 votes. Rating: 9.09/10. From 484 votes. Rating: 9.09/10. From 454 votes. Rating: 9.09/10. From 379 votes. Rating: 9.09/10. From 360 votes. Rating: 9.08/10. From 5967 votes. Rating: 9.08/10. From 5203 votes. Rating: 9.08/10. From 3156 votes. Rating: 9.08/10. From 2556 votes. Rating: 9.08/10. From 2252 votes. Rating: 9.08/10. From 1615 votes. Rating: 9.08/10. From 1498 votes. Rating: 9.08/10. From 972 votes. Rating: 9.08/10. From 966 votes. Rating: 9.08/10. From 901 votes. Rating: 9.08/10. From 817 votes. Rating: 9.08/10. From 775 votes. Rating: 9.08/10. From 659 votes. Rating: 9.08/10. From 551 votes. Rating: 9.08/10. From 397 votes. Rating: 9.08/10. From 243 votes. Rating: 9.08/10. From 157 votes. Rating: 9.07/10. From 2501 votes.